Whether you're tight on space, or you just want to give any room of your home a new look, consider investing in some sliding closet doors. Sliding doors don't open into the room they are installed in, which eliminates door swing concerns, and with the multitude of different style options available, you're sure to add a touch of detail to the room as well. 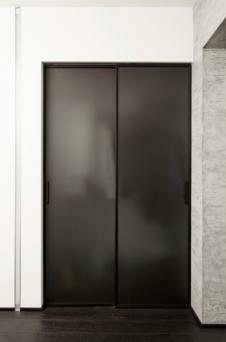 Sliding closet doors are one of the most functional styles of door for reach-in closets. A sliding door provides the biggest opening for reaching your clothes and doesn't often come off its tracks like bi-fold doors. 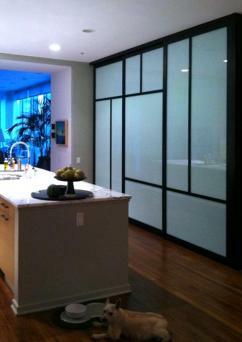 Sliding doors can be categorized by style, material and placement. There is often overlap between the various styles and materials; choosing one often means choosing another at the same time. Pocket doors slide right into the wall they are installed on, making them one of the best options for homes that are tight on space. The door slides on tracks installed at the top and bottom of the stud wall, allowing them to disappear right from site. They can be made of wood or metal, with some styles having built-in glass panels as well. Size: Pocket doors can be any size because they do not have to overlap one another or the wall itself to open and close. Subtlety: Pocket doors are discreet. They blend right into the decor of the room and don't call attention to the closet. Maintenance: If your door slips off its track, you'll need to open the wall to get it back in correctly. Installation: Pocket door kits help make installation easier, but you will still need to open up the stud wall to get it in correctly. Masonite is a company that produces doors out of high-quality MDF and makes a number of different styles of doors, many of which can be purchased as a pocket door. Masonite sells its products in specialty and hardware stores across the country; find a dealer near you on their Where To Buy page. TruStile has more than 60 different door styles and materials to choose from, including custom models. Nearly all their door styles can be purchased as a pocket door. Locate a TruStile dealer in your area to get started. Frosted or decorative glass makes a sliding closet door that conceals your belongings while adding some style to the room they are installed in. Glass doors are typically constructed of a metal or wood frame surrounding each door or panel. The doors themselves may be made up of one or several panels per door, depending on the style selected. Style: Glass doors don't just hide your closet; they give the eye something else to focus on in the space. Space size: Glass -even frosted glass- helps to enhance the amount of light in a room by reflecting it. 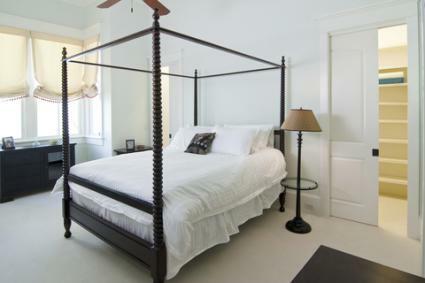 This can make smaller spaces appear larger than they are. 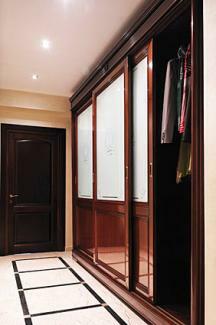 Custom sizing: Glass doors are very often cut and fabricated to the size of your closet. This lets you select the glass, number of panels and overall style to suit your space. Durability: While many manufacturers use tempered glass, or coat their glass with anti-shatter membranes, glass doors may still fracture, crack or shatter upon impact, which may make them a safety issue. The Sliding Door Company makes all their doors to order, which means you'll get the door best suited to your needs. 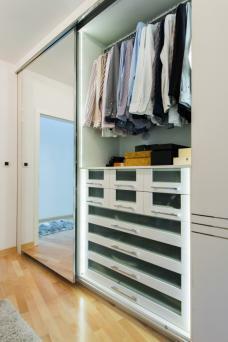 If the room your closet is installed in is small or dark, consider investing in mirrored sliding closet doors. Mirrored doors visually enlarge any room they are installed in by doubling the amount of visual space. They also double the amount of available light, which further helps to open up the room. Because mirrored doors are made of glass, they have the same advantages and disadvantages as standard glass doors, with the added benefit of style. Closet Doors Depot makes both steel and aluminum-framed mirrored glass doors in a wide range of different sizes, including their luxury collection which features a wide range of styles. They ship anywhere in the United States. Wooden doors may be built to order, or purchased ready-to-install, depending on the wood species, size and style selected. Style: Wooden doors come in a nearly endless array of different styles to complement your decor. Durability: Solid wood doors in particular are extremely durable, lasting for years without maintenance. Lightweight: If you choose a hollow-door construction, your closet door will be very light and less likely to slide off the rails. Swelling: If you live in a humid area, or your closet is in a bathroom, be prepared for the wood of the door to swell, which could cause it to stick, or not open and close properly. Weight: If you choose a solid-wood door, the weight may cause it t osag or pull at the track. It is adjustable, but you will need to perform routine maintenance. Kestrel Closet Doors are available in several styles, including sliding shutter, Shaker, raised panel and fabric-inlay. Kestrel is also listed as one of the leading closet door manufacturers at Construction Index for the quality of their workmanship. Interior Door and Closet sells hollow and solid core doors in plain, custom and decorative styles, including a variety of wood species. Metal doors are difficult to find, but they offer some unique options. Metal doors may be used as a frame around a glass door, or they can be made of solid aluminum or stainless steel. The doors may be left with the metal finish showing, covered in a baked-on finish identical to paint or covered in materials that allow children to decorate their doors using dry erase markers and magnets. Durability: Metal doors do not chip or scratch, and rarely dent. They will often last for years. Style: Metal doors offer style options not always available with other materials. Weight: Metal doors may be more likely to come off their hinges and need adjusting than some other doors. Availability: There are fewer manufacturers and options to choose from for metal doors. Dunbarton is currently the only mass manufacturer of metal doors, currently sold at Menards and through distributors nationwide. Both steel and Marker Doors that can be decorated for children's rooms are available. 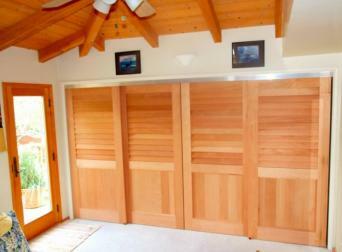 A new set of sliding closet doors can update not just your closet, but the entire room they are installed in. Update your closet with a new set of sliding doors and see what possibilities it opens up.